Congratulations to AEROTACTICS!! He was the winner of the OOTP 18 giveaway! WAHOO!! Didn't win? Keep watching - I have another to give away later!! BUSTIN OUR WAX - 1978-79 Wax Packs! This week, we bust open several packs of 1978-79 wax! Most of it is non-sport, but there is a pack of 1978 O-Pee-Chee in there! Talkin Tribecards - Cards from Mark Aubrey! Hey all! Well, I managed to mess things up. Last week, I published a post with a link to a video that didn't go out until THIS week. D'oh! And, the post that WAS supposed to go up last week didn't go up at all... Such is my life, hahaha! Sometimes, you come across things that are related to your collection but aren't necessarily something you might usually collect. 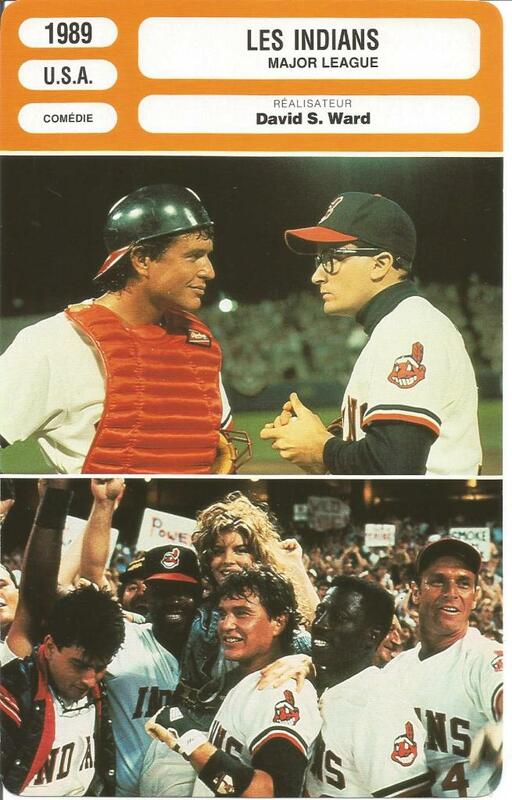 Here, I present such an item: A movie placard from France, featuring "Major League." The card itself is roughly 5" x 8"
Of course, I grabbed it because the movie is all about the Indians, but I don't usually collect movie cards (okay, I admit - I had never even heard of these before seeing this one). The front features the release date, country and genre on the top left. The movie's title (with the team name, no less - I guess that is what he movie was called in France) and Director name in the upper right finishes the top portion of the card. Below, we have two stills from the movie. 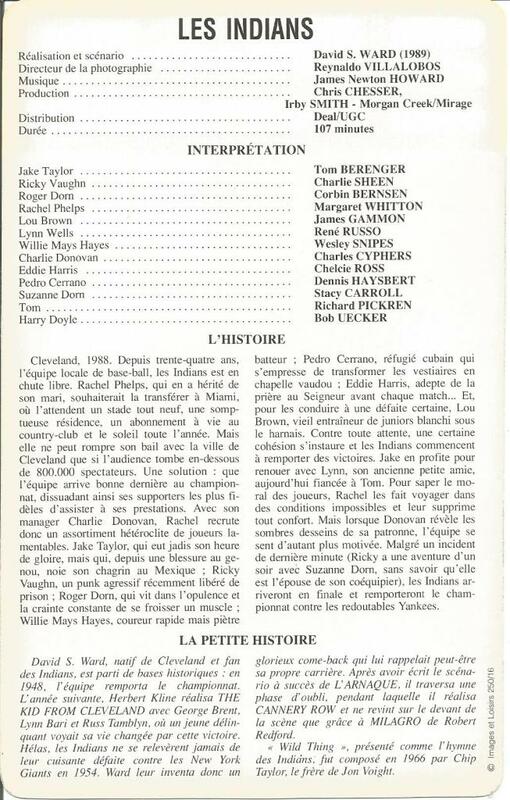 On the back, the French name of the movie (Les Indians), presumably, along with actor, crew, and "L'Histoire." There is also a section called "La Petite Histoire." It has been decades since I took French class, but it appears that the first section covers the movie's synopsis and the second is more about how/why the movie came about in the first place. I have to say, this is a VERY cool addition to my Indians collection!